The man's family had put out an urgent appeal on social media asking if anybody had seen him. Late afternoon yesterday police were called to reports of a body found in a small wooded area at the front of Eastlake Park business park at Fox Milne. The busy estate is opposite the Jaguar Land Rover garage on Tongwell Street. Officers guarded the scene for several hours, sparking concerns that the body could have been that of missing teenager Leah Croucher. This morning they confirmed on the Thames Valley Police Facebook page that the body was that of the missing man. 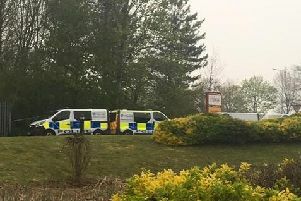 Their statement read: "Thames Valley Police officers sadly located the body of a man aged in his thirties just off the V11 Tongwell Street, near to Opal Drive, in Milton Keynes overnight. "The death is being treated as unexplained, but not suspicious, and the man’s next of kin have been informed. "A scenewatch that was in place has now been lifted and a file will be prepared for the coroner."